Foamtech has created a premium quality conductive polyurethane foam. This product is engineered for applications requiring greater than static electricity protection. Low density urethane, is available for packaging of odd shaped parts for the transportation of printed circuts, computer chips, etc. 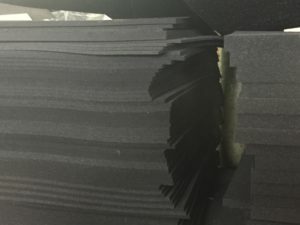 Foamtech also has high density conductive foam. The high density foams are specifically engineered for lead insertion and are designed to prevent degradation. An outstanding advantage for using Foamtech’s conductive foam is cleanliness. There is no sloughing, it is non-corrosive and does not particulate. Conductive foam is available in standard sheets, cut to size, die cut, convoluted and laminated to other substrates, such as pressure sensitive adhesives and corrugated. Please see our specifications sheet for additional information. We can make assemblies using both high density lead inserted foam and low density packing foam.